Young Stenographer, Who Made the Report of the Conversation in Room No. 31 Williams House, Voluntarily Makes Statement Before a Notary Public in the City of Washington D. C., Where He Is Employed. Swears That A. S. Colyar Has Made Effort to Purchase His Original Notes, Which Are Now in Possession of His Brotheró”Grand Jury Should Make an Investigation” Declares Mayor James G. Woodward. The sworn charge that the dictagraph statements, alleged to have been made by Colonel Thomas B. Felder, Mayor James G. Woodward and Charles C. Jones, in Room No 31, Williams house, were “padded” was brought back to Atlanta last night by Ed O. Miles, a private detective, and turned over to Mayor Woodward. The affidavit was composed and sworn to by George M. Gentry, the stenographer who took the dictagraph conversations. Detective Miles located Gentry in Washington, D. C., where he has been employed during the past two weeks. The affidavit was sworn to before Jeannette Henning, a notary public. GENTRY WILLING TO RETURN WHENEVER HE IS NEEDED HERE. Aside from the charge that his stenographic notes were “padded” by A. S. Colyar, and that he was paid $50 for the part he played in the dictagraph drama, Gentry says that he left Atlanta because he could not bear the humiliation which he knew he would suffer after he learned that his notes had been altered. His affidavit bears out the statement made by Mayor Woodward, immediately after the publication of the dictagraph scandal, to the effect that he did not mention the names of Chief of Police James L. Beavers or Detective Chief Newport Lanford. 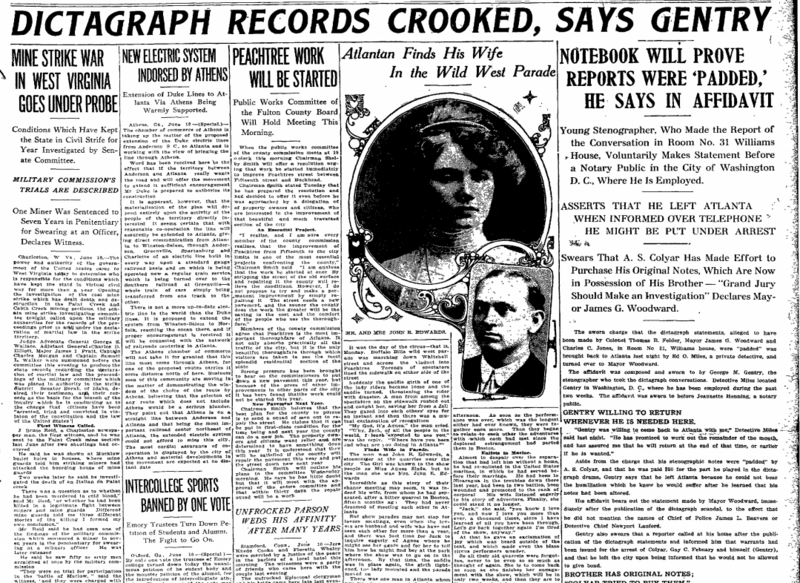 Gentry also swears that a reporter called at his home after the publication of the dictagraph statements and informed him that warrants had been issued for the arrest of Colyar, Gay C. Febuary and himself (Gentry), and that he left the city upon being informed that he would not be allowed to give bond. According to the affidavit, the original notes taken by Gentry are in the possession of his brother. He charges that an effort was made to purchase them. He mentions Colyar as the man who tried to secure his notes. Lanford Doesn’t Believe Gentry Signed Affidavit. Thus did Chief Lanford caustically arraign the affidavit from Washington when he was informed of its receipt. He says that not until he has seen and talked with the young stenographer will he believe that Gentry attested to the document, and, that if Gentry does admit its authorship, he will brand that youth a liar. Mr. Gentry’s Affidavit in full is as follows. “After a few minutes, during which time Mr. Febuary was absent, we went over to the Williams house No. 2, on North Forsyth street, Atlanta, Fulton county, Georgia (Mr. Febuary and I), and I was instructed to go into Room No. 21 of this hotel. Mr. Surles and Mr. Colyar were there, and they probably had to make arrangements for adjoining rooms, as Mr. Surles commented to me that they hadn’t decided just what to do with the dictographs. After a time Colyar came in and instructed Surles to follow him, and gave me instructions to await his wishes. Later on Mr. Febuary came in, and I told him that if I had to wait much longer by myself I was going back to the office. “I was then allowed to come into the room, where they were installing the dictographs (one on each end of the bottom board of the bureau just under the bottom drawer on the back of the board), and the wires being run through the keyhole of the door between Room 31 and Room 32. The bureau was then screwed against the door facing. At about 12:30 I started getting accustomed to Febuary’s and Colyar’s voices. “At first I could not hear at all, but gradual[l]y I was able to hear more distinctly and after an hour or two of diligent practices I was able to use the dictograph and to distinguish voices very clearly. Right at the beginning I found that I would not be able to hear anything with the windows up. When they were closed it became rather stuffy and this, coupled with the strain I was under, added to the distraction. I stopped particing [sic] at 2:45 that afternoon and went downstairs to the office of the hotel, where I awaited Mr. Felder’s arrival. “I placed the retriever over my head, and in order to be sure that I would hear everything, Mr. Febuary stood behind me and held them pressed tightly to my ears. This conference lasted about thirty minutes. Between 8:30 and 9:15 Wednesday night Mr. Febuary loafed about town, as we had an appointment with Mr. Branch and Mr. Paschal at 9:30 at the Williams house, and as they were not in The Journal office, we had to kill time until they showed up. I left Mr. Febuary and Mr. Colyar at The Journal office at 9:15 and went over to the Williams house to wait for the arrival of The Journal reporters mentioned above. They came in shortly and we went over to The Journal office and all of us (Colyar, Febuary, Branch, Paschal and myself) went up to the editorial department, where a machine was selected and I then went to work transcribing what I had heard. “Right at the start I made Colyar angry because when I did not hear what was said I put dashes and so I allowed him to dictate several answers and questions, which do not appear in my notebook and which I am not positive that I heard. I did not hear Mayor Woodward mention Chief Beavers or Chief Lanford during the whole conversation, nor did I write it in the transcription of my notes, these names being evidently added by other parties. At 4:30 Thursday morning, May 22, I finished transcribing my notes and turned the papers over to Mr. Febuary. Later on during the morning he came down to the office, bringing an affidavit which I had written for me to sign before a notary public. He told me that they had made only a few minor changes in the transcription, and that all I had to do was to sign the affidavit which I did. However, I noticed that some interlineations had been made in my copy, or rather in Chief Lanford’s copy, as I had no copy. Colyar and the reporters, just before I started to transcribe my notes, argued as to the number of copies that should be made. They agreed that one copy should be made for the chief, one for Colyar and one for The Journal, and that no more should be made. This kept me from having a copy. I had my notebook, however, and it was the comparison on my notes with the published articles that lead to my discovery that in addition to the several answers and questions which Colyar had personally dictated, other changes had been made, namely that insertion of the names of Chief Beavers and Chief Lanford, in the conference with Mayor Woodward, also many other variations occurred, changing the sense of the statement, and since they had my affidavit attached to the papers I felt that I had been duped. “As to the remuneration of my services, will say that The Journal reporters, Branch and Paschal, agreed to pay me $5 to get the work written Wednesday night, so it could be published in Thursday’s paper. Saturday morning, after the appearance of the article in Friday’s Journal, The Georgian’s reporter came to the office and offered me either $25 or $45, I do not recollect which, for a copy of the conference with Mayor Woodward, February, Miles and Colyar, and Miles, Jones and Colyar’s conference. I declined the offer. I then went to see The Journal’s reporters and told them that The Georgian had offered me money for a copy of the conference, and they agreed to pay me $50 to hold my notebook from Saturday until Monday. I turned my notebook over to Mr. Brice, who gave it to his stenographer to keep until Monday. Later during the day the reporters told me that The Georgian had gotten a copy, and so I was too late. “I then went down to Mr. Brice’s office and asked Miss M.—, Mr. Brice’s stenographer, for my notebook, and I took it home and locked it up. Monday, when I went up to see Major Cohen about the $50 he went down to look for Mr. Brice, whom he was unable to find. Later we went back upstairs together and Branch and Paschal explained to him their promise to pay me $50 for allowing The Journal to retain my notebook. However some argument arose over the fact that I took my notebook out of The Journal’s office Saturday night. I told them that they had agreed to give me $50 not to make a copy for The Georgian, and that I had not made the copy for The Georgian, and had, therefore, carried out my part of the compact. They then told be to come back later on and see Mr. Brice about it. I returned after awhile, I believe it was around 1 o’clock, and Mr. Brice paid me the amount in currency and took my receipt. “Chief Lanford has not as yet paid me for my services, from the fact that I have not rendered a bill. “Saturday morning, before the publication of the Woodward conference, held at 4 o’clock Wednesday, May 21, as previously mentioned, and the Jones conference, held at 8 o’clock the same night, I went to the editorial department of The Journal and requested a proof of what they were going to print. Colyar, who had one reading it, declined to allow me to have a proof, and so I left The Journal building, suspicious. “Saturday afternoon I went down to the office, carrying with me my original notebook, and a copy of Friday’s and Saturday’s Journal. I compared them all the way through and upon seeing the many variations in what was printed and what I had in my notes, I realized that my transcriptions had been tampered with, and that I had just cause for the suspicions which were aroused by their refusal to allow me to read the proofs Saturday morning. “Having signed the affidavits, at Mr. Febuary’s request, in which I swore to what I had heard, and seeing something entirely different published, I became very nervous and uneasy. Saturday night when I went home, a reporter called up and said he was one of The Journal reporters and wanted to see me a few minutes. I told him to come over. He came in and introduced himself to me as Mr. Starr, The Journal. My other and aunt recognized his voice as that of a reporter who had called shortly before I came home, and said he was from The Georgian. They both rushed into the sitting room and told me that he was not with The Journal, but was the same fellow that came a few minutes ago, and said he was from The Georgian. He denied that he had said he was from The Journal, although he had told both myself and my grandfather, who went to answer the door bell, that he was from The Journal. Just before he left he informed me that a warrant had been sworn out for Febuary’s, Colyar’s and my arrest, and upon my directing him as to where the door out could be found, he departed, saying that he had got the information he wanted. “Sunday afternoon, at the office, someone called me up and informed me that I would probably be arrested Monday, I did not recognize the voice, and so am unable to say who it was. They also informed me that I would have to make bond in order to be released. I asked who it was, and they hung up or were cut off. “Monday morning Colyar requested that I turn my notebook over to The Journal and said he would give me $5 if I would show him a receipt from The Journal for the notebook. I came near allowing The Journal to have the notebook, but instead gave it to my brother to take home and instructed him to allow no one to have it. “Developments later showed me the character of some of the people connected with this transaction and it made me so ashamed of my connection with it that I was afraid I could not face the humiliation that I thought would naturally onsite, and also the fact that they had changed my transcription showed to me very clearly that I was mixed up with a bunch of crooks. “I am prepared to read my notes whenever it becomes necessary. These notes will show exactly what I heard. “The foregoing affidavit is made by me voluntarily, unsolicited, and no money or the promise of any remuneration whatever was offered to me for making it, my sole motive being to give the straight history of my connection with the now ‘infamous’ dictograph affair.